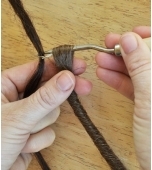 Pushing bundles of your own hair through the loop at the top of single ended dreadlock extensions can be tricky but this Latch Hook makes the job so much easier and ensures the loop is not stretched open. 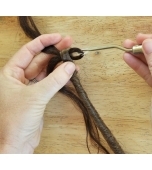 INSTRUCTIONS: Push the hook through the loop, grab the bundle of hair and as you pull it back through the loop the latch will close. You can then secure the extension in place with a braid. INCLUSIONS: 1 x Hook. 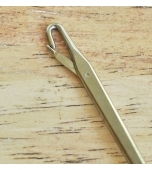 The hook measures approximately 1 cm (from top of hook to bottom of latch).